In the developement of children musical education is an important part. The early preoccupation with music and instuments not only help building a elementary appreciation for music but also help with coordination skills. How does this apply to the Cajon? In the early education with music there is a few fundamental goals to reach such as: dance and movement, playing an instrument, aural training and improvisation. All these areas can be covered through the Cajon. Especially by learning easy rhythms, children learn how to imitate a motion sequence. Although it is very important not to overwhelm the kids at a young age. Complicated Instruments require practice for months before you see any results. With the Cajon you can learn easy rhythms and songs within a short amount of time. Without frustration! 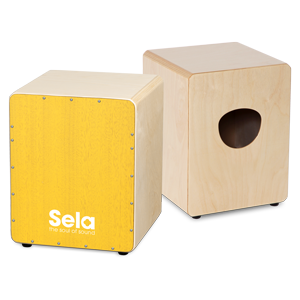 The small Cajons from Sela are perfect for children! For aural training the Cajon can be very beneficial. It‘s very important for children to learn how to distinguish two sounds. Due to different sound variations of the Cajon, children can differ high-pitch and low-pitch noises after a short amount of time. Improvisation is another important point, which can be accomplished with the Cajon. When childrens fanstasy runs free, they can find their own individual rhythm and foster their creativity. And finally, the most important point: Fun! Cajon playing causes happiness - even without elementary knowledge. Another opportunity to bring children closer to music is the construction of a Cajon in a group. 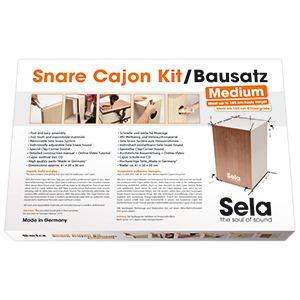 The Sela Snare Kit is the perfect resolution for that. Children can improve their technical abilities and subsequently learn how to play on the self constructed Cajon. Books for a smooth entry into the Cajon world you can find on the website of Hage Musikverlag. For example Cajon Method from Martin Röttger.